Throughout history patriotic Americans have been drawn together to serve a cause greater than themselves. Some came because of a common experience. Most came because of common values. All came because they shared a dream. 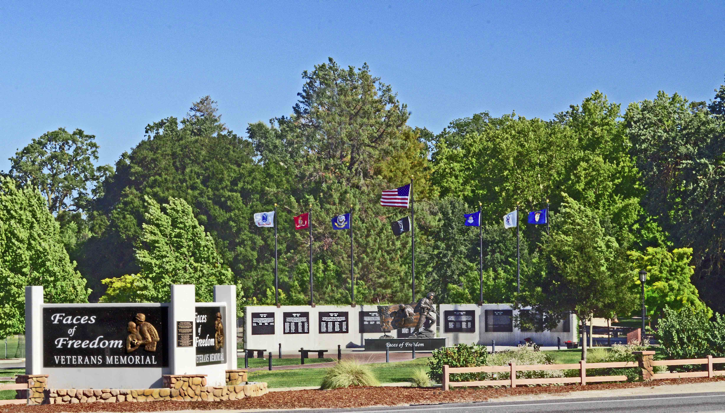 The people who belong to the Atascadero Veterans Memorial Foundation are such a people. They believe that the true reflection of America is in her ability to honor our Veterans of the past, who have given so much that Americans might live free. They feel the Memorial honors our military members serving today, as it represents those who stand guard between America and those who seek to destroy her. Finally, the Foundation believes the Memorial is about our future, as it will be used to teach our youth about our nation's core values and will serve as a symbol of our gratitude to those, who through their service and by their sacrifice, put their country first. today, not only with words, but with this lasting tribute. "All gave some . . . some gave all"
View "Faces of Freedom" from the air.